Synthetic peptide (Human) derived from the region of human Focal Adhesion Kinase that contains tyrosine 861. The sequence is conserved in human, mouse, rat, chicken and frog. Chicken embryo fibroblasts expressing Focal Adhesion Kinase protein and plated on fibronectin. Focal Adhesion Kinase is a 125 kDa non-receptor protein tyrosine kinase that is a substrate for Src and a key element in growth factor and integrin signalling. Focal Adhesion Kinase plays a central role in cell spreading, differentiation, migration, cell death and acceleration of the G1 to S phase transition of the cell cycle. Tyr861 of Focal Adhesion Kinase is a major Src phosphorylation site that allows Focal Adhesion Kinase to bind to integrins and is also involved in cancer. 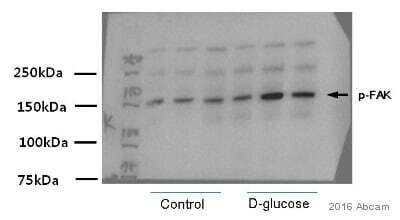 Purified from rabbit serum by sequential epitope-specific chromatography. The antibody has been negatively preadsorbed using (i) a non-phosphopeptide corresponding to the site of phosphorylation to remove antibody that is reactive with non-phosphorylated Focal Adhesion Kinase protein, and (ii) a generic tyrosine phosphorylated peptide to remove antibody that is reactive with phosphotyrosine (irrespective of the sequence). The final product is generated by affinity chromatography using a Focal Adhesion Kinase-derived peptide that is phosphorylated at tyrosine 861. Our Abpromise guarantee covers the use of ab4804 in the following tested applications. WB Use at an assay dependent concentration. Predicted molecular weight: 125 kDa.Can be blocked with FAK (phospho Y861) peptide (ab5304). Can be blocked with FAK peptide - phospho Y861 (phospho and non-phospho pair) or CEF whole cell lysate, positive / negative for Focal Adhesion Kinase (pair). 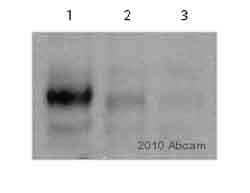 Western blot - Anti-FAK (phospho Y861) antibody (ab4804)Image courtesy of an anonymous Abreview. Primary antibody incubated for 16 hours at 4°C. Blocking step was performed using 5% milk for 1 hour at 25°C. Publishing research using ab4804? Please let us know so that we can cite the reference in this datasheet. in Maus zu testen da er für humanes ApoER2 ausgeschrieben ist. Dies hatten wir nun auch getan, allerdings ohne Erfolg (siehe Anhang). genau hervor geht, dass dieser Antikörper zum Testen bestellt wurde. Können Sie mir hierbei weiterhelfen? positiv Kontrolle, da wir kein humanes ApoER2 Konstrukt haben. Vielen Dank für Ihre Anfrage und Ihr Feedback. Direkt unter dem Antikörpernamen oder wenn Sie auf den reiter (tab) "Abreviews" klicken und dann "submit an Abreview". Bitte geben Sie den Gutschein Code in den "additional notes" in der Abreviewform an damit er aktiviert wird, wenn der Abreview eingereicht wird. Danach kann der Code auf einer neuen Bestellung benutzt. werden. Es tut mir leid zu hören, dass Sie Probleme mit ab4804 in WB haben. Ich habe unseren Fragebogen als Word-Dokument an diese E-Mail angehängt. Durch das Ausfüllen des Fragebogens erhalten wir alle nötigen Informationen über Ihre Proben und Ihr Protokoll. Sobald Sie dieses Formular an uns zurückgeschickt haben, werden wir uns Ihr Protokoll ansehen und möglichst Veränderungsvorschläge machen, die Ihre Ergebnisse verbessern werden. Falls sich herausstellt, dass der Antikörper nicht so funktioniert, wie auf dem Datenblatt beschrieben und er innerhalb der letzten sechs Monaten gekauft wurde, werden wir Ihnen gerne einen Ersatz oder eine Gutschrift schicken.